$9.99Orange Foam Light Up Glow Stick - 18"
Did you know that the original jack-o-lanterns were turnips, gourds, and potatoes carved by Irish homeowners to either pay tribute to or scare away evil spirits? The tradition came along for the ride as colonists arrived in America and discovered some native vegetation that worked even better for carving purposes: you guessed it, the pumpkin! All due respect to those other vegetables, who have been nothing if not noble in their contributions to our autumn traditions, but we have a hard time imagining the jack-o-lantern as anything but a pumpkin. It’s just such a perfect fit, with its attention-grabbing orange color, its spacious and highly carvable oblong shape, and its roomy insides that seem just made for nestling a flickering candle. We can’t say for sure how effective they are at warding off evil spirits (although we will note that we’ve never encountered one of those while we had a lit jack-o-lantern watching the house), but we can attest that they’re excellent at making us feel right at home on a late fall evening. 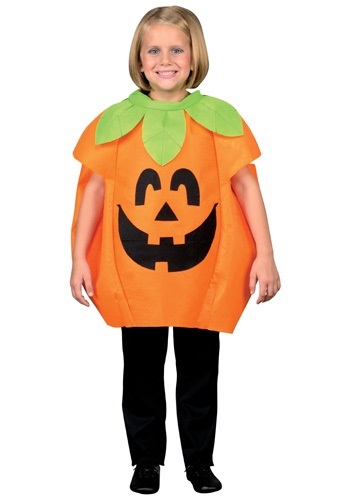 This autumn, your kid can celebrate the noble pumpkin in this loose-fitting polyester jack-o-lantern tunic. With a leafy green collar and a smiling, snaggle-toothed face, it looks about as friendly as a vegetable designed to chase away Halloween ghosts could possibly be. If you wanted to be more traditional, we suppose you could try to track down a grinning turnip costume, but we kind of suspect you’ll have a tougher time with that. Maybe you’re better off sticking with the tried and true pumpkin.